Raise your hand if you know someone who has gotten a DUI. The reality is that it is an incredibly common occurrence. You may even have gotten one yourself! Nevertheless, the fact remains that there are a number of questions surrounding DUIs and how they relate to bail bonds. That’s why in today’s post the team at Wanna Get Out Bail Bonds is here to lend a helping hand to ensure that your biggest questions get answers. First things first. We have an entire page dedicated to DUI arrest information and it’s there specifically for those who need information 24-hours a day. We know that emergencies don’t happen on a schedule. That’s why they’re called emergencies! At the end of the day, we want our clients to know that we’ll be here 24/7 to lend a helping hand in their time of need. When it comes right down to it the big takeaway is the fact that we offer fast and reliable service that is specifically tailored to suit your specific needs. No matter what your situation looks like, we’d be glad to ensure that you have the information you need. We’ve answered a handful of questions including ones about how making bail helps and what to do if you can’t afford your bail amount in the page above, but we’d like to go into more detail in today’s post. If you’ve ever had a question about DUI bail bonds, this blog is for you. Keep reading to learn more! In other words, the whole thing is a pretty serious affair. The good news is that if you turn to WGOBB then you can rest assured that we’d be glad to listen to the details of your specific situation. We proudly offer free bond advice, so if you’re in a situation where you need a DUI bail bond, we’re the team to turn to. How Much is a DUI Bail Bond? Like many of these situations, the truth is that the amount of a DUI bail bond can vary from state to state and situation to situation. Generally speaking, the amount that you pay could be as low as $500 if it is your first offense. Misdemeanor DUIs typically range from $500 on the low end all the way up to around $10,000. Felony bail bonds can increase all the way up to $50,000. That’s probably not particularly helpful if you’re trying to get an idea of how much a DUI costs, but the truth is that there are a number of different factors that come into play and it’s important to know the specifics of a given situation. Can You Purchase a Bond From Jail? This is another question that we get asked on a regular basis, and the answer is yes. Although it may be a little bit more difficult than securing a bail bond from the outside of prison, fortunately the team at Wanna Get Out Bail Bonds can help. No matter the situation, no matter the time of day or night, we pride ourselves on being a helpful resource for each and every one of our clients. We want people to have all of their bases covered, and that’s why we’d also like to present you with the following option: if you’re in jail, have a loved one help you to facilitate your release. In other words, getting help from a friend or family member might be invaluable. You can use your time inside to communicate with a loved one who will then get in touch with us, ensuring that you are able to get out of jail quickly. After all, someone who is outside of jail will have a much easier time speaking to us and providing us with information than someone inside will. Just be certain to make sure that your loved one provides us with your name, your case number, and the jail you’re being held at and we’ll take care of the rest. If there’s any other information that is pertinent to your situation please keep in mind that it’s always easier and faster for us to get you out quickly if we have all of the facts. 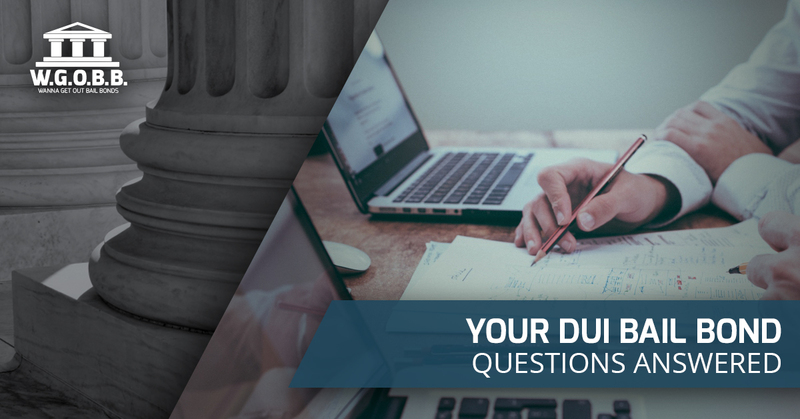 Have more questions about DUIs and how a bondsman can help? If so, be sure to keep your eyes on this space to check out part two where we’ll go into detail even further to ensure that all of your questions are answered. Of course we also want you to know that you can call us at any time to get free bond advice and we also accept collect calls. We know how stressful DUI situations can be but we want you to know that we’ll always be there to lend a helping hand. We can help with any court, any jail, any time. Contact us today to get the help you need. We’ll be there for you when you need help the most.